DALLAS—Students at Dallas Baptist University honored the late Dr. Martin Luther King, Jr. this past week. For the sixth year in a row, a group of DBU students and staff headed out to serve the community. Once again, they joined with Cornerstone Baptist Church to serve during the Martin Luther King Jr. Parade. The group spent the day passing out food and water to those gathered for the parade. In the meantime, volunteers used their time and interactions to strike up meaningful conversations with attendees and other volunteers. 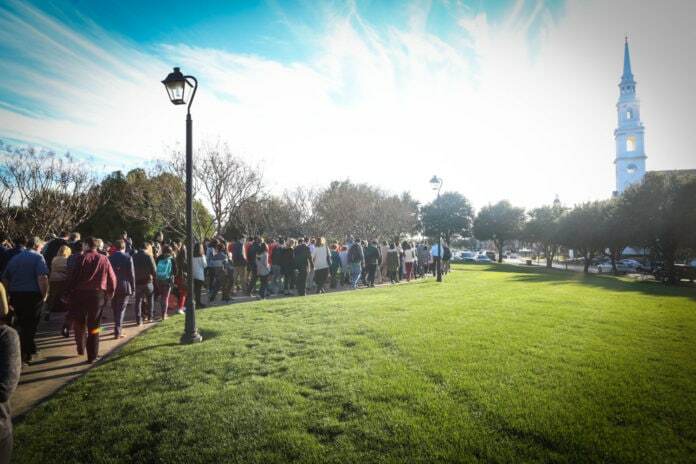 Later that day, the DBU community gathered together for the Inaugural MLK Unity Walk. Beginning at the Collins Learning Center on campus, a significant crowd of faculty, staff, and students walked together toward the middle of the campus Quad, where they paused for a special prayer time led by Marion Hill-Hubbard, DBU Director of Career Services, and Desi Henk. After Hill-Hubbard concluded her prayer, those gathered broke off into smaller groups for a focused time of prayer for peace and unity in our country. Later, the group continued the walk to the Cross on the DBU campus that stands between the Mahler Student Center and Patty and Bo Pilgrim Chapel. Four DBU students recited Dr. King’s “I Have a Dream” speech as those who gathered reflected on the words of the great Christian leader. Following the reading, the time concluded with a prayer, led by DBU President Dr. Adam Wright.